Removal of joint fluid has a dual purpose—diagnostic and therapeutic. While finding the cause of joint swelling is the goal, the removal of fluid may also help to relieve pain and pressure on the joint. Sterile technique must be followed when obtaining synovial fluid for analysis. Precautions are taken so that bacteria are not introduced into the joint. 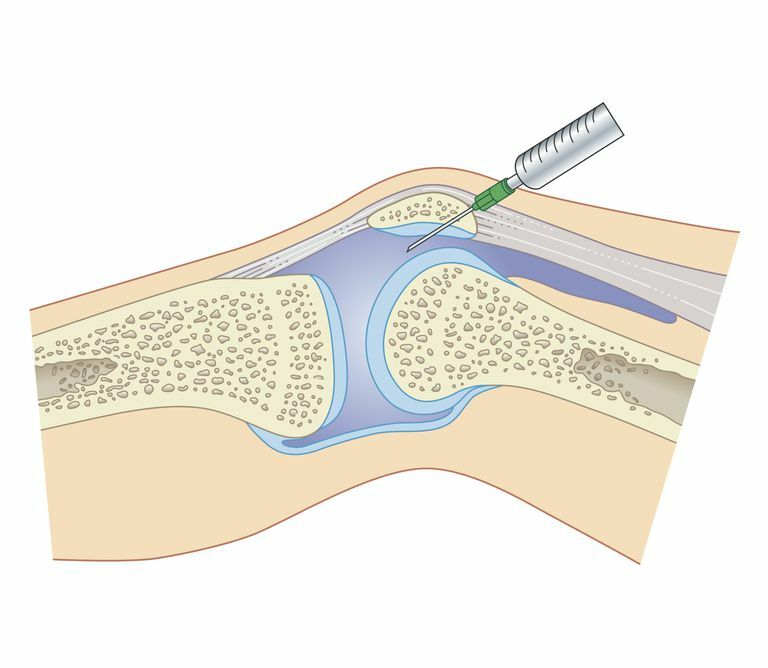 A sterile needle is used to draw joint fluid from the affected joint, but first, the skin is sterilized using a topical agent, e.g., Betadine (povidone-iodine). A local anesthetic is also used. After the fluid is withdrawn from the joint, the doctor may inject medicine (usually a corticosteroid) into the joint using the same injection site. A bandage is applied after the needle has been removed. Once the joint fluid arrives at the laboratory for analysis, it is observed by the human eye for color and clarity. Normal joint fluid is viscous and appears clear to light yellow. Cloudy joint fluid is abnormal and suggestive of inflammation or infection. Bloody joint fluid is also abnormal and may be caused by trauma to the joint. Joint fluid is examined under a microscope for the presence of blood cells, crystals, and bacteria. Normal joint fluid has none or few blood cells. Large numbers of red blood cells indicate bleeding in the joint. Large numbers of white blood cells can occur with infection, inflammatory arthritis, gout, or pseudogout. Crystals are an abnormal finding. Uric acid crystals are indicative of gout while CPPD crystals occur with pseudogout. Bacteria is also abnormal. A culture can identify the source of a bacterial infection. Joint fluid is observed in a plain tube after one hour for the formation of a fibrin clot. The quality of clot is graded, but any clot suggests that there is a problem with the synovial membrane. Another test known as the mucin clot test (acetic acid is added to synovial fluid) estimates the production of hyaluronate. Poor mucin clot formation is associated with inflammatory types of arthritis. Blood tests or other laboratory tests can also be ordered with the intent of supporting the evidence derived from the synovial fluid analysis. Clinical Diagnosis by Laboratory Methods, Todd-Sanford. Does Sports Participation Cause Arthritis? What is Joint Lavage and is it Still Performed? Can Joint Juice Help Relieve Your Joint Pain? Is a Nutraceutical the Same as a Dietary Supplement for Joint Health?